Have you ever seen a font on a menu or sign or in a magazine and wondered what it is? Perhaps because you think it would be perfect for a job you’re working on? Or perhaps because you’re a designer who’s simply font-mad like me? 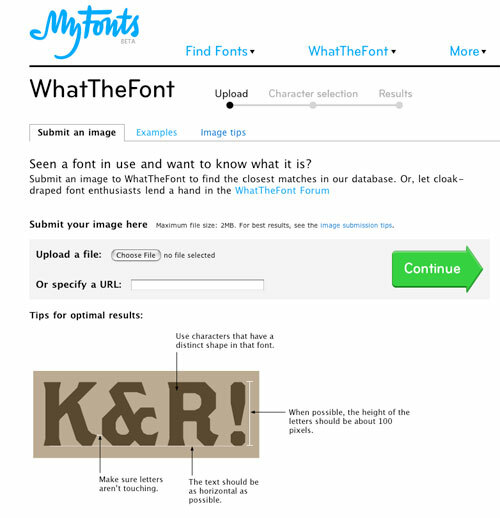 Now there’s a new online service in beta from MyFonts.com called What the Font that allows you to upload an image file (up to 2 MB) and will attempt to match and identify the typeface. Snap an image with your iPhone or other mobile device, prep it according to the site’s requirements, and upload it. If there’s no match in their database, there’s also a forum where you can post your type sample and see if anyone there can give you the name.